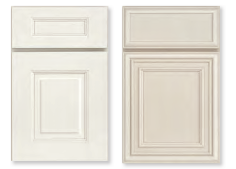 Medallion Cabinetry - New Finishes! This unique finish is achieved by artfully brushing multiple glaze materials onto a stained surface. 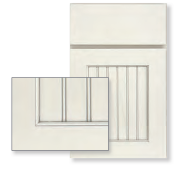 Thicker than a normal glaze, the varying shades of application create a subtle textural feel and appearance. Available in Gold on select door styles in oak and quartersawn oak. Two new classic paint colors for Gold and Silverline on maple. Irish Créme lends a soft gray hue; Chai Latte a subtle taupe hue. Available with pewter highlight.